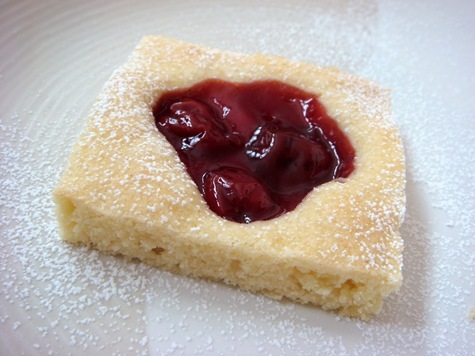 These shortbread squares are light and tender, not hard and crumbly; almost more like a short little cake than a cookie, but firm enough to hold in your hand to eat. The batter mixes together quickly, and is then spread onto a baking sheet. Use a toothpick to lightly score the batter into 24 squares. The lines will disappear as the cookies bake, but they make it easier to know where to place your cherries. The cherry topping is simply cherry pie filling-I used some that I canned this summer from tart cherries, but any variety of canned pie filling will work. Place about 3 cherries in the center of each square. As the cookies bake, the pie filling will sink about halfway into the batter. Little A loves these cookies: they are light and slightly lemony, and not a hint of chocolate. Preheat oven to 350°F. Grease and flour a half-sheet pan (about 12×17 inches) with a 1-inch rim, or spray it with baking cooking spray (with flour). In the bowl of an electric mixer, beat together the butter and sugar until very light and fluffy, about 2 minutes. Beat in the lemon extract, lemon zest, vanilla and salt. Beat in the eggs one at a time. Scrape down the bowl. On the lowest speed, stir in the flour until just barely mixed. Spread the batter onto the sheet pan and smooth it into an even layer. 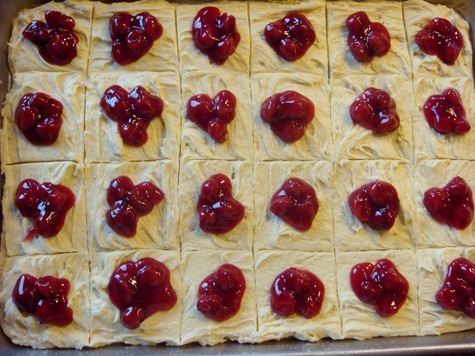 Score the batter into 24-30 squares with a toothpick (don’t worry about perfectly even squares as the lines will disappear during baking; it just makes placing the cherries easier). Place 3 cherries in the center of each square. Bake for 20-25 minutes, or until a toothpick comes out clean. Cool completely in the pan on a wire rack. 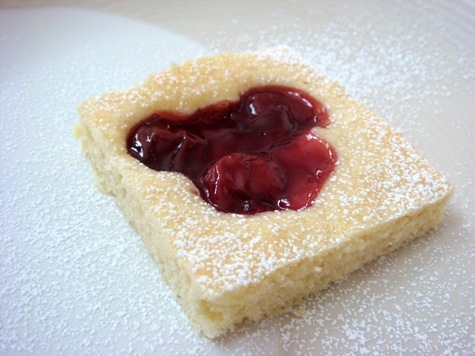 Just before serving, cut into 24 squares and dust lightly with powdered sugar.